Gelatin, Microcrystalline Cellulose, Vegetable Magnesium Stearate, and Silicon Dioxide. Seek advice from a health care practitioner to use this product if you have high blood pressure, heart or thyroid disease, diabetes, difficulty in urination due to an enlarged prostate, or if you are pregnant, nursing, or taking an MAO inhibitor or any prescription drug. Reduce or discontinue use if nervousness, tremors, sleeplessness, loss of appetite or nausea occur. Not intended for use by persons under 18 years of age. Do not exceed recommended serving size. Keep product at room temperature (59-86F). Do not expose to excessive heat or moisture. Keep out of reach of children. Must be 18 years of age to use. Raw HGH uses highly concentrated extracts to get the most effective ingredients as possible into one capsule. 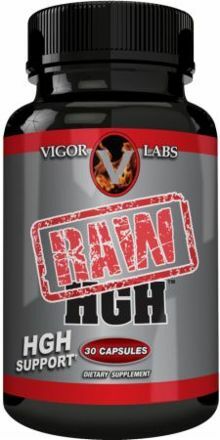 For maximum benefits, try Raw HGH with Black Antler by Vigor Labs, which is made with real Deer Antler Velvet. * NOTE: This product does not contain HGH.